Interested in mounting your GoPro or similar action camera on your dog? 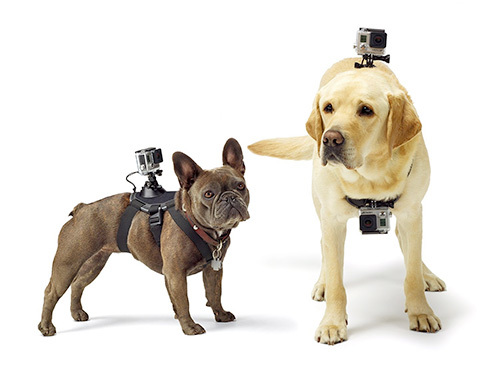 There are now special GoPro dog mounts and dog camera harnesses available for just this purpose. When you mount your GoPro to your dog, you can get a dog’s eye view of the world. It can result in some pretty neat or funny footage. There are a few different types of GoPro dog mounts so you’ll want to pick the right one for your pet. The Kurgo Dog harness with camera mount comes in four different sizes to fit dogs of different sizes (small through extra large). It features adjustable black straps to fit securely around your pet’s front legs and stomach to securely mount a GoPro on your dog. Works with either GoPros, cameras that work with GoPro mounts (like GeekPro or Lightdow cameras, etc) as well as Sony Action Cameras. The chest area is padded and wide for a comfortable fit. Note that it doesn’t come with the GoPro mounting accessory so you’ll need to provide your own. If you want a GoPro harness for a dog that comes with all the mounting gear you need in one package, the official GoPro Fetch kit is probably the right choice for you. It works with two dog mounting options, which you can either use separately or at once to mount two cameras on your dog! The first is on top, giving a “third person” dog angle, and the other is an “underneath the chin” camera mount. This waterproof dog mount comes in black and is adjustable to fit dogs that weigh anywhere from 10 pounds to 120 pounds. Soft and padded for your pet’s comfort. 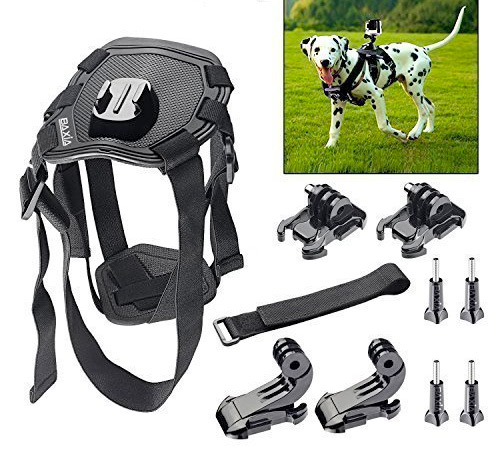 The underneath view is better than a GoPro dog dollar, because your dog will probably find that too heavy, whereas with this chest mount it distributes the weight more evenly than a dog collar for GoPro would. Here’s another GoPro dog mount to harness your action camera on your dog. 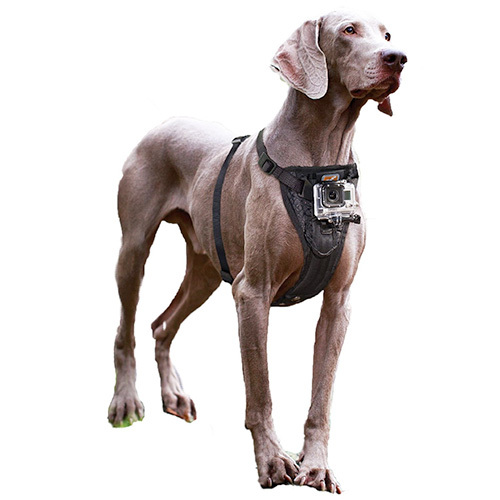 It comes with a variety of GoPro pet mounting accessories and is adjustable to fit dogs of a variety of different sizes. You can mount your GoPro or other compatible action camera (any camera that works with the standard GoPro camera mounts) either on top of your dog, or under it’s chin for a dog’s eye view. Washable and waterproof. What is the best action camera for hunting?